TO AVOID ANY CONFUSION, THERE WILL BE NO FURTHER BLOGS UNTIL SUCH TIME AS I AM AFFILIATED WITH WAVERLEY COURT CONSULTING LIMITED. I have had a discussion with my wife who took the article totally a different way than I had meant and I worry others would do likewise. I am not someone who brags or talks about the great I am. My mantra is to understate as the only thing that matters are the people – my family, my friends and my clients. So to anyone who read the original article – all I was trying to say was how proud I felt that through my endeavours my clients have been able to live the life they deserve. Please forgive me if it came across as arrogant or bragging – that was the last thing it was meant to be. I understand the principle of “Restricted Advice” and as a business model understand the needs of a bank to maximise profits, minimise costs and control the focus and the advice. I accept that they have made the decision to replace the IFA Arm with a “Restricted” Advice Model. I believe that this is appropriate for a sales model to offer Restricted Advice whereas “Independent” will be left to those offering advice rather than product sales – yes, I am biased as I am and will always remain an INDEPENDENT FINANCIAL ADVISER – service and advice is my mantra. I am unclear of RBS’s use of the term “specialist” within the Restricted Advice model. This is very close to my heart, as I am in the final stages of serving notice with Jewell & Petersen Ltd – I will be trading through my limited company Waverley Court Consulting Ltd as an Appointed Representative of Julian Harris Financial Consultants. The reason for this is to retain my status as INDEPENDENT, the service provision, support received and care I provide to my clients both now and in the future following the changes implemented in 2013. It’s official, Royal Bank of Scotland’s IFA arm is set to become “Restricted” Advisers under a restructure of the banks financial advice division which saw it announce plans to cut around 600 financial planning roles earlier this month. The advisers who were IFAs within RBS will form the backbone of a new restricted service which will also house some of the advisers affected by the cuts announced last week. The new service is expected to launch in October 2012.The advisers under the new restricted advice proposition will be called “specialist” financial advice managers with additional roles to be filled through internal recruitment and some advisers will be dedicated to business and commercial customers.An RBS spokeswoman said: ‘we will be offering a full advice service to our customers under a “restricted” badge, our existing IFA advisers will be moving into the new advice model together with a significant number of new advice roles being created. 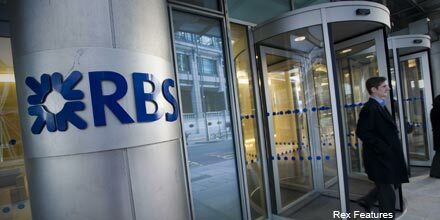 ‘The present RBS Group advice model is composed of IFA and tied propositions across private bank and financial planning.’The bank said it was currently researching its final panel proposition but confirmed that it will consist of solutions from the RBS Group and a set of third-party providers. Monday to Wednesday we saw positive market growth and then Thursday happened, which lead to a nondescript trading day on Friday. Looking across all indices it is clear that this is NOT a decisive end to the recent rally – the market has managed to hold the line above key pivotal points. There was not much data for last week and what there was, was not of the most influential nature. Some numbers came out of the property sector and the data was reasonable. The good news – all data considered, there are improvements in the figures from the construction and general property market. There is still a long way to go to see these markets to return to the prosperity seen before the recession but they are improving. Last week’s FTSE 100 high around 5,620 confirms one of the items the bulls should have been worried about – resistance at the 150-day moving average line. The upper 20-day Bollinger band has also shown a point of resistance. This may be a tough threshold to cross. The VIX index spiked on Thursday to above 20 and has since dropped back to 18.11, back below both the 200 day and 150 day resistance level. This adds weight to te bulls argument, at least short-term. In fact, had it not been for the VIX’s new trend back under its key moving average lines and then its continued pressure on the lower Bollinger band lines, we might not be able to say the VIX was clearly moving lower. SO WHAT DO WE THINK THIS MEANS ? It may not be exciting but there is no strong trading indicator – the market’s are at a crossroads. My personal expectations are bullish – ultimately based on the VIX and the overall market momentum. 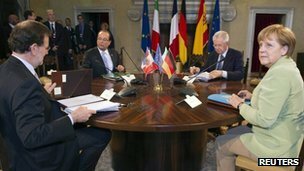 Germany, France, Italy and Spain have agreed measures to boost growth expected to achieve growth of 1% of the currency area’s economic output through a 130 Billion Euro Growth Fund. The growth package is expected to comprise several measures already in the system, such as, to boost spending on infrastructure and other investments, backed by European taxpayer money. The concern being no new money is expected to be involved, the agreement will end as more symbolic than physical. The money meantioned has already been agreed and is in the system – so it will not be a massive injection of cash to rescue struggling European economies. The agreement may represent a political victory for the recently elected French president, who has demanded a growth pact despite strong reservations expressed by his Germany counterpart. The leaders also sought to agree other proposals on closer integration – including a banking union and a financial transactions tax – to be put forward at the broader EU summit. However, they did not reach any agreement on the idea of eurobonds – jointly backed Eurozone government debts used to finance EU government budgets. Friday’s talks had been expected to involve a formal Spanish request for Eurozone financial assistance. However, no mention of a request was made in the press conference following the talks. The Spanish, Italian and French leaders have advocated a banking union for the Eurozone, likely to entail much stronger central regulation and supervision of European banks, as well as the creation of a common Europe-wide deposit guarantee scheme. Spanish and Greek banks have experienced significant withdrawals of deposits in recent months, on fears that they may be insolvent, or that their home nations may exit the euro. All the banks in Eurozone peripheral economies, including Italy, have found it very hard to borrow from other banks and money managers since last autumn, forcing the European Central Bank to provide them with an unprecedented trillion euros of three-year emergency loans over the New Year. Market Sell-Off Or Start of a Rally? The commodity markets suffered one of the worse days for market sell-offs yesterday – is this a clear indication of a global economic contraction? We all know that the fundamentals have been deteriorating for some time but have the eternal bulls now thrown in the towel? In other words, perception is negative. 15 international banks have been downgraded including Barclays, Bank of America, Goldman Sacks, Citigroup, J P Morgan, Morgan Stanley, Deuteche Bank and Credit Suisse, to name just a few. This will drive sentiment and fear further undermining confidence and the hopes for global prosperity. This has led to a bit of consolidation and profit taking following the recent declines and relief rally (post the Greek election). It could be something far more dire or reality finally entering the markets. Well, the volatility keeps you questioning. Fundamentals haven’t changed but investor sentiment certainly has – in the last month we have seen the VIX index drop from near 27 to under 18 and now back above 20. This shows sentiment is fragile and is lurching from one extreme to the other. So are we looking at global declines and the end of the world as we know it? I don’t think so – right now sentiment is negative and for those willing to accept the volatility this could be profitable. Care as always is needed as some markets will benefit through this difficult times and some will “crash and burn”. For those in the commodity space – you are in for a very rough ride and there is currently a higher likelihood of loss rather than gain. What ever sector/manager/strategy you take – take care as this is a very opportune but troublesome markets. The Fed’s move is a reaction to a fairly gloomy assessment of the state of the US economy. The recovery in America is still happening, but slower, and what’s going on in the rest of the world poses “significant risks”. The Federal Reserve cut its forecast for economic growth in 2012 from 2.9% to 2.4%; and predicted a central unemployment rate of up to 8.2%, having forecast up to 8% on 25 April. Ben Bernanke confirmed their plan is to keep long-term interest rates low, in the hope it will encourage the consumers to spend and businesses to employ more workers. This is an extension to the policy, which started back in September 2011. In yesterday’s announcement the Fed also extended its programme of swapping short-term bonds for long-term ones, known as Operation Twist, until the end of the year. The idea of the programme is to cut the long-term cost of borrowing for businesses and households. (The programme is worth $267 Billion (£170 Billion). The central bank’s statement pointed out that “growth in employment has slowed in recent months, and the unemployment rate remains elevated”. It has kept interest rates unchanged at the level of zero to 0.25%. This was a rather a somber affair off the back of strong stock market movements but so far this may just be a relief upswing. The general opinion is this has, at least in part been driven, over the Eurozone Crisis and especially the outcome of the Greek Election. 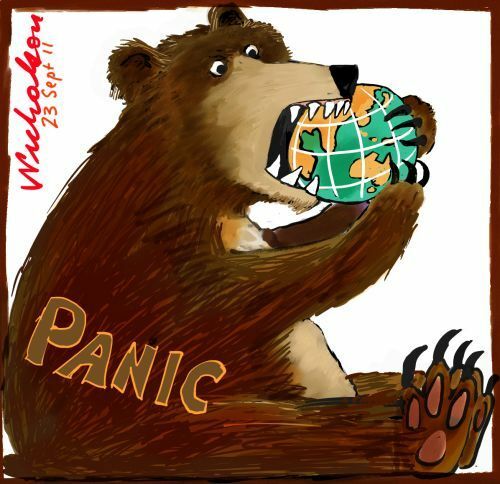 There is still the rather worrying economic and fiscal news from Span and Italy; or the overhang fears from India and possibly China (but tinged with some potential of positive news shortly from China – fingers crossed).